This example requests three 5-stage group sequential designs for normally distributed statistics. Each design uses a triangular method with the specified one-sided upper alternative reference . The resulting boundary values are displayed with the score scale. Note that these unified family triangular designs are different from Whitehead’s triangular designs. The first design has early stopping to reject or accept the null hypothesis . The "Design Information" table in Output 101.6.1 displays design specifications and derived statistics. With the specified alternative reference, the maximum information is derived. The "Method Information" table in Output 101.6.2 displays the and errors and the derived drift parameter, which is the standardized alternative reference at the final stage. The table also shows the corresponding parameters for a triangular method as a unified family method. The "Boundary Information" table in Output 101.6.3 displays information level, alternative reference, and boundary values. With the specified BOUNDARYSCALE=SCORE option, the alternative reference and boundary values are displayed in the score statistic scale. With a score scale, the alternative reference is , where is the specified alternative reference and is the information level at stage k, . The "Error Spending Information" table in Output 101.6.4 displays cumulative error spending at each stage for each boundary. 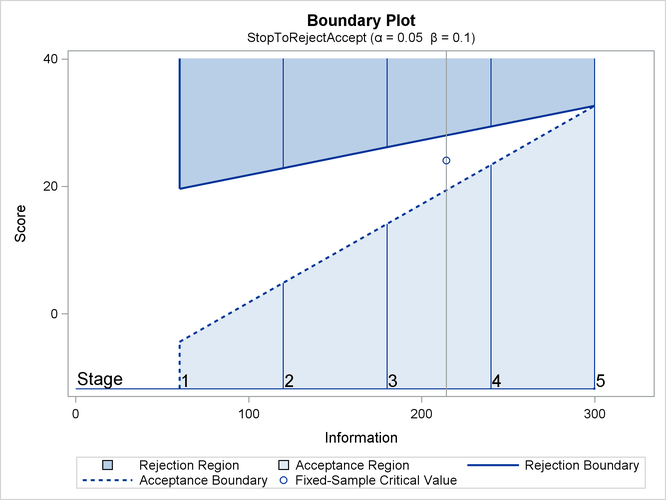 With ODS Graphics enabled, a detailed boundary plot with the rejection and acceptance regions is displayed, as shown in Output 101.6.5. 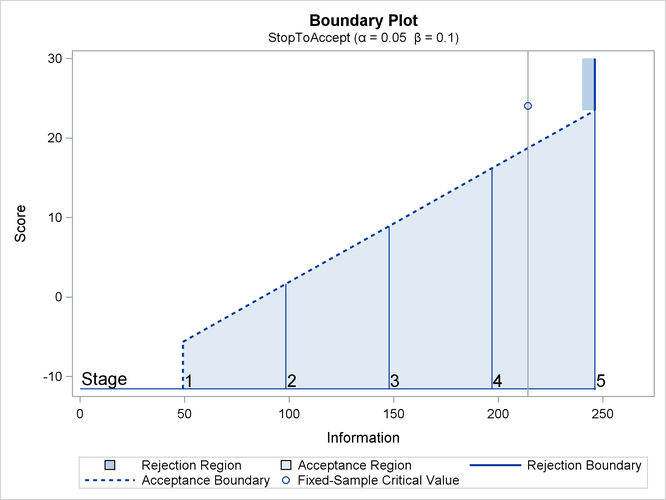 With the STOP=BOTH option, both the acceptance and rejection boundaries at interim stages are displayed. With the score scale, the acceptance and rejection boundaries are straight lines and form a triangular-shape continuation region. The second design has early stopping only to reject the null hypothesis . The "Design Information" table in Output 101.6.6 displays design specifications and derived statistics. With the specified alternative reference, the maximum information is derived. The "Method Information" table in Output 101.6.7 displays the and errors and the derived drift parameter. The table also shows the corresponding parameters for a triangular method as a unified family method. The "Boundary Information" table in Output 101.6.8 displays information level, alternative reference, and boundary values. With the specified BOUNDARYSCALE=SCORE option, the alternative reference and boundary values are displayed in the score statistic scale. The "Error Spending Information" table in Output 101.6.9 displays cumulative error spending at each stage for each boundary. 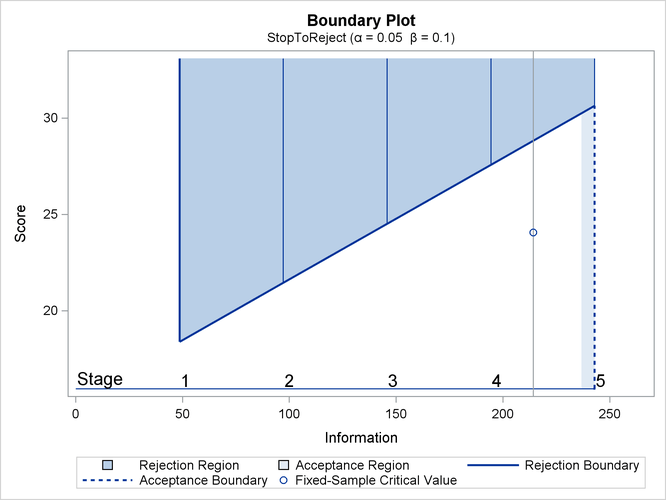 With ODS Graphics enabled, a detailed boundary plot with the rejection and acceptance regions is displayed, as shown in Output 101.6.10. For a triangular design, these rejection boundaries form a straight line with the score scale. The third design has early stopping to accept the null hypothesis . The "Design Information" table in Output 101.6.11 displays design specifications and derived statistics. With the specified alternative reference, the maximum information is derived. The "Method Information" table in Output 101.6.12 displays the and errors and the derived drift parameter. The table also shows the corresponding parameters for a triangular method as a unified family method. The "Boundary Information" table in Output 101.6.13 displays information level, alternative reference, and boundary values. With the specified BOUNDARYSCALE=SCORE option, the alternative reference and boundary values are displayed in the score statistic scale. The "Error Spending Information" table in Output 101.6.14 displays cumulative error spending at each stage for each boundary. 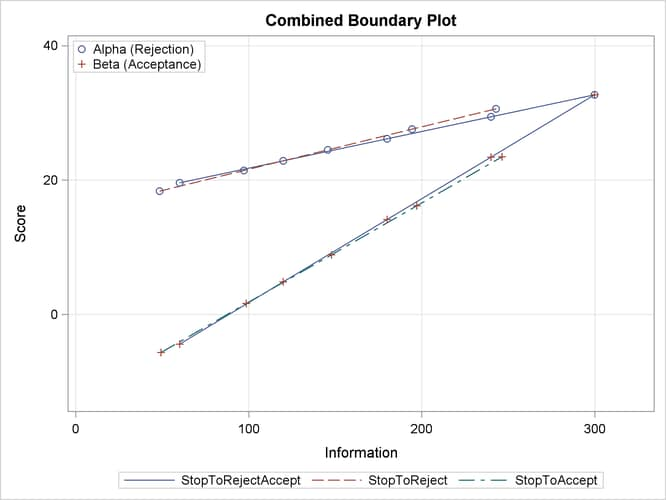 With ODS Graphics enabled, a detailed boundary plot with the rejection and acceptance regions is displayed, as shown in Output 101.6.15. For a triangular design, these rejection boundaries form a straight line with the score scale. With the PLOTS=COMBINEDBOUNDARY option, a plot of the resulting sequential boundaries for all designs is displayed, as shown in Output 101.6.16. The plot shows that the design with early stopping to reject and to accept has larger maximum information than the other two designs. With the PLOTS=ERRSPEND(HSCALE=INFO) option, the error spending plot is displayed with the information level on the horizontal axis, as shown in Output 101.6.17. 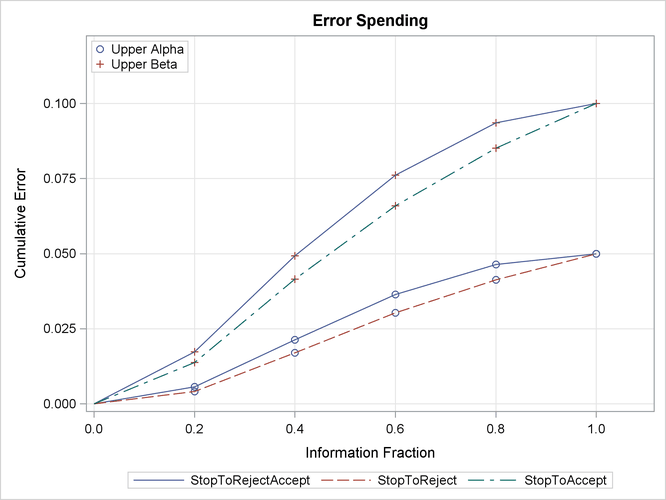 The design with early stopping to reject or accept the null hypothesis has larger spending and larger spending in early stages than the other two designs.